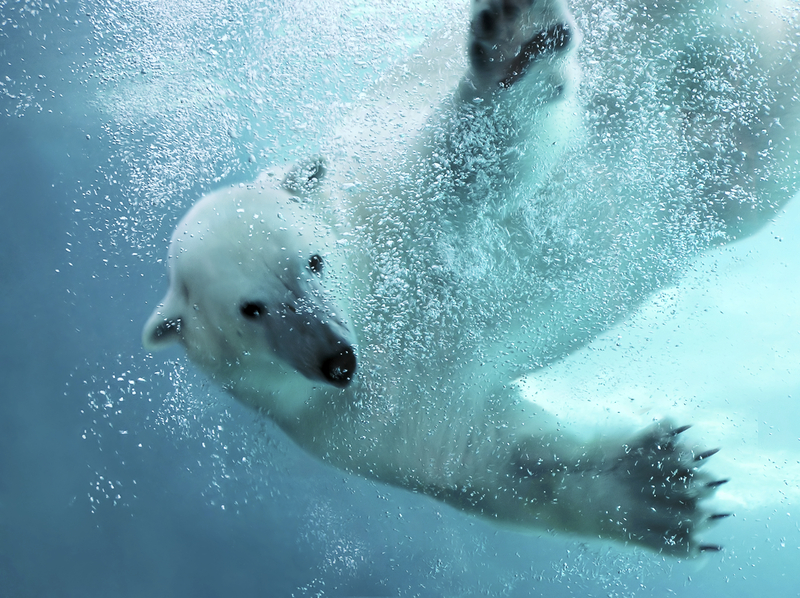 Polar bears are known to be excellent swimmers, but new research suggests that they are also superb divers. Scientists recently observed a polar bear dive that lasted 3 minutes, 10 seconds, shattering the previous known record by about 2 minutes. The researchers -- Ian Stirling from the University of Alberta in Canada, and Rinie van Meurs, a naturalist and polar expedition leader from the Netherlands -- were studying polar bears in the Norwegian archipelago of Svalbard (located between continental Norway and the North Pole, east of Greenland), when they witnessed this epic underwater swim. The researchers described the dive in the August edition of the journal Polar Biology. This record-breaking dive was also for food, but this bear had bigger prey in mind. The emaciated polar bear, which the researchers observed from the deck of a ship, was hunting a group of three bearded seals that were lounging about on a sheet of floating ice, called an ice floe. The bear slipped into the water and started swimming toward the seals before diving below the surface to continue what the researchers called his "aquatic stalk." After spending more than 3 minutes underwater, the polar bear "exploded" out of the water and propelled itself halfway onto the ice floe, right in front of where one of the seals was resting. Unfortunately for the hungry bear, the seal got away, the researchers said. But the entire hunt was recorded on video and on film, allowing the researchers to confirm that the polar bear had not come up for air before lunging onto the ice. The polar bear's ability to hold its breath for so long is interesting to the researchers because it could be a sign that these animals are evolving to survive in a habitat that is rapidly changing. Global warming is leading to a dearth of sea ice, the researchers said, meaning polar bears have less ice on which to hunt. As such, the animals must spend more time in the water than they did previously when hunting for seals and other terrestrial prey. "It is possible that the ability to hold its breath for so long may indicate the initial development of a significant adaptation for living and hunting in its marine environment," the researchers wrote in the study. Polar bears diverged from their ancestors, brown bears (Ursus arctos), between 400,000 and 500,000 years ago, which is quite recent in evolutionary terms. The polar bear's propensity for underwater breath holding may be a trait that still hasn't fully evolved, but it's unlikely that the animal can evolve fast enough to adapt to life at the quickly shrinking polar ice caps, Stirling and van Meurs said.